Pink diamond engagement rings are among the rarest and most sought after. These rings can make a uniquely exquisite statement for the couple who prefers extraordinary jewelry, offering classic styling with a contemporary twist. Pink diamonds are very rare, and the majority of the world's supply is mined in Australia, at the Argyle mine. Since these diamonds are so exclusive, they are more unusual and typically more expensive. Gordon's Jewelers has several ring styles, some of which are only available online. The Enhanced Pink and White Diamond Fram Twist Engagement Ring.This ring is set in 14K white gold and features a 1/3 carat enhanced round pink diamond center in a halo of small, round diamonds. It all is set in a beautiful twisted shank. The Pink and White Diamond Frame Filigree Ring has a pretty vintage style and is done in 14K white gold. Zales features a collection of ring styles with pink diamonds, including solitaire, three stone rings, and halo styles. The 7/8 carat Radiant-Cut Enhanced Pink and White Diamond Double Frame Ring. This ring is set in platinum and 18k rose gold and features a center pink diamond with two rows of smaller white diamond square halos. Zales also has the 1/2 carat Enhanced Pink and White Diamond Split Shank Engagement Ring. This ring is set in 14K white gold and has a round enhanced pink diamond center stone. MDC Diamonds features several pink diamond rings. 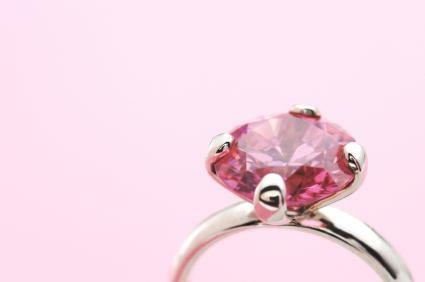 Although the selection is small, it is unique in that most use the pink diamonds as special accents rather than a central stone. One to check out is the Cushion Diamond Engagement Ring with natural halo set pink diamonds set rose gold. Tiffany & Co. features several pink diamond rings that would make any woman happy. The Fancy Deep Pink Diamond Ring is stunning and elegant. It is set in platinum and features two rows of white diamonds that surround a large center pink stone. Another ring from Tiffany's is the Fancy Intense Pink Diamond Ring. This ring features a pear shape pink diamond center that is set in platinum and is surrounded by single row of round brilliant white diamonds. Pear Shaped Pink Diamond Ring: This unique ring has a pink central pear shaped diamond surrounded by a halo of white diamonds. Three Stone Pink and Yellow Ring: This stunning piece has a central radiant cut pink diamond and is mounted in platinum and 18K rose gold. 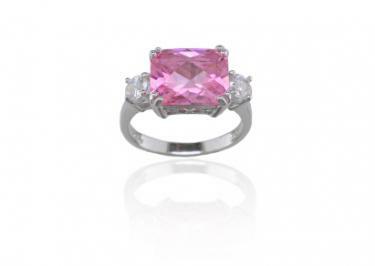 Overstock carries several styles of pink diamond rings. The 14K White Gold Pink and White Diamond Ring features a three-stone setting with a pink diamond center flanked by two smaller white diamonds. The band features pave set diamonds all the way around and milgrain edging. Another ring to check out is the Sterling Silver Pink Diamond Solitaire. This ring is an affordable option for someone looking for a simple yet elegant ring. It used one solitaire pink diamond for the center and sets it in shiny sterling silver. Leibish Co. sells loose pink diamonds that can be used in any ring setting. Browse the selection of diamonds in variety of shapes such as round, princess, oval, teardrop and emerald. Ice Store is another source for loose fancy pink diamonds. If you have a ring setting in mind, browse through their selection of diamonds to find the one that will best match it. Amgad has a large inventory of natural pink diamonds in a variety of shapes and prices. 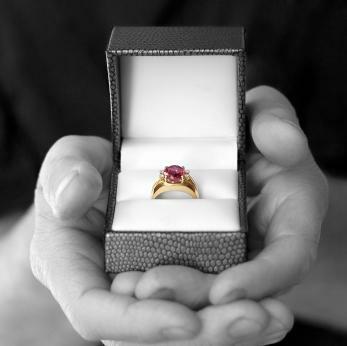 When buying a pink diamond ring there are some important points to bear in mind. The quality of the diamond is the key to a beautiful piece of jewelry. While every couple should be familiar with the four Cs of diamond quality, pink diamonds have some unique considerations different from colorless stones. Some precious stones such as pink diamonds are treated to alter or stabilize the color. A color treated diamond has therefore been artificially treated to give it its color. There are pros and cons for both color treated and untreated or natural diamonds. While naturally colored diamonds are the most highly prized - they are also the most expensive. A high quality naturally colored diamond can be extremely costly. Color treated diamonds are less expensive and more readily available. Fancy diamonds are judged on the intensity of their color rather than their lack of it. 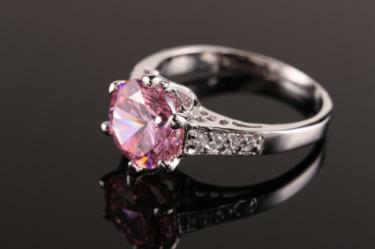 Pink diamonds are available in very light pink, rose, salmon, and nearly magenta hues, but darker colors are far rarer. Most pink diamonds only have a faint pink tint, and in a small stone it may be difficult to detect. When choosing a pink diamond engagement ring, examine the stone for color consistency to be sure you purchase a quality piece. Because of their rarity, pink diamonds are often more expensive than larger, colorless cousins. Because of that, a smaller carat weight pink diamond will be a larger investment than heavier traditional stones. Typically, the smaller the stone, the less intense the color. However, if it is professionally judged as a pink diamond, the color will be a greater factor in the price than the actual carat weight. The unusual color of a pink diamond is eye-catching enough without elaborate cuts or shapes, though round, marquise, and princess cuts are the most popular choices. Rather than experiment with unusual cuts, many couples choose a simple pink diamond with an elaborate setting that draws attention to the stone. Clarity is a crucial factor in the quality of any diamond, especially colored stones. While flaws and inclusions may appear as a bit of cloudiness in clear stones, they can drastically change the color of fancy diamonds. When purchasing a pink diamond, the stone should have a uniform color free from feathers, cracks, dark or light areas, and spots. These flaws will be far more visible to casual observers than they would be in traditional diamond. An important consideration for a pink diamond ring is the metal that it will be set in. To bring out the stone's color, choose a setting done in white gold or platinum rather than yellow gold. Yellow gold can cast a yellowish hue onto the stone. Due to their rarity and rising popularity, pink diamonds are typically more expensive than regular diamonds. As with any jewelry, however, a low-quality pink diamond will be less expensive than a high-quality colorless gem, and each factor in a diamond's price can be adjusted and balanced to find a stone the couple is happy with while not destroying their budget. Many people consider diamonds to be white gems, but they are more accurately considered colorless. Fancy diamonds are those with distinctive colors, such as yellow, green, red, orange, brown, and pink. They are less common than colorless diamonds. In general, a completely colorless gem is more valuable, but diamonds with color may be graded and priced more highly if they have very high color saturation. A pink diamond engagement ring is an unexpected twist on a traditional diamond. From light rose to deep magenta, a pink diamond is a daring beauty of a gem and provides an ultra-feminine and unique touch to any engagement ring.